William Shakespeare’s Measure For Measure is considered his first problem play. The production now playing at the Emerson Cutler Majestic Theatre presents only one problem. It is here for only six performances, and a few of those performances are competing with the Red Sox in the World Series. 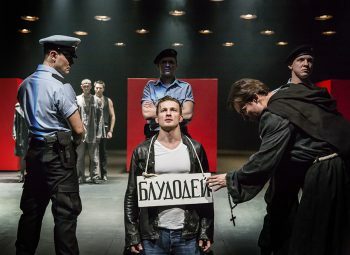 This is too bad as the play, which is a collaboration by London’s Cheek By Jowl and Moscow’s Pushkin Theatre, directed by Declan Donnellan, and with a cast that speaks entirely in Russian (there are subtitles), is as interesting a production of one of Shakespeare’s works as you will see. Set on a nearly bare stage with five large red boxes lining it, and an array of hanging lights of the type you might see in an industrial building, the starkness takes on a full life as the cast of thirteen enter and begin this story of power, the fairness and abuse of authority, hypocrisy, and conflicting principles. It is one of Shakespeare’s least performed, yet most moving works. And yes, I wrote it is performed entirely in Russian, which may seem offsetting to some who can’t imagine seeing the works of the Bard performed in anything other than the original verse. However, I am here to tell you it works wonderfully when performed this way. There is definitely a synergy when Russian actors take on Will Shakespeare. Interestingly, two of the most widely acclaimed film versions of King Lear and Hamlet were produced by Russian director Grigori Kozintsev, so this mix is not new. As the play begins the cast moves about the stage in a tight group without uttering a line. It is a device that is used to varying extents throughout the play as the crowd, in different sizes serves as witnesses, or perhaps a conscience, to and for the main characters. 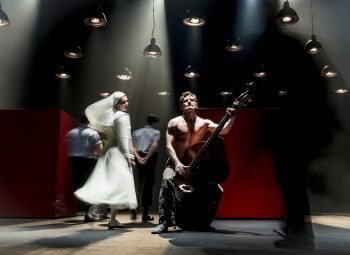 Angelo (Andrei Kuzichev) is played as a mousy bureaucrat who is given power by the Duke (Alexander Arsentyev), in the classic ambivalent role. Anna Vardevanian’s Isabella is very interesting in that she gives us a more fragile and complex reading then I have seen before. Her “Man proud man” speech when confronting Angelo over his lack of compassion when enforcing the law is spoken more in mockery than anger. I found this to be very effective. Her facial expressions are priceless, especially in the closing scenes. 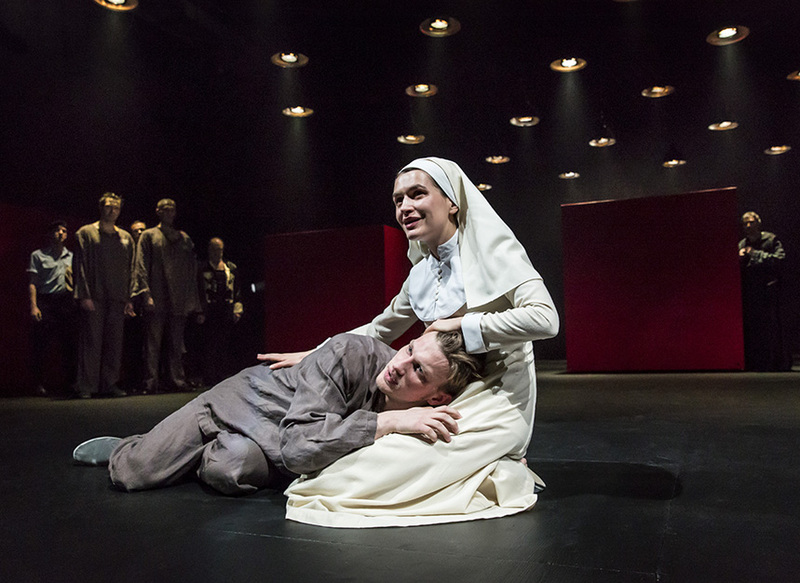 There is much more to be said for this very talented cast, but time grows short, and you really should be making plans to see this Measure For Measure. It is a timely work that will have you reflecting on how power is wielded and what happens when people are too rigid and hypocritical when ruling over others. Of course there is much more to it, but you should really see for yourself. I highly recommend you do. This is a unique and fast moving production that should not be missed. ArtsEmerson is giving Boston theatre goers a gift. Accept and enjoy it.